Super creamy and delicious Gluten-Free Butternut Squash Macaroni and Cheese! 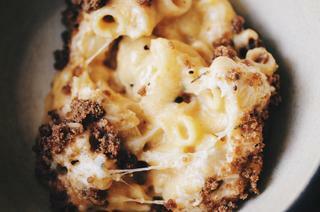 This cheesy dish with its flavorful breadcrumb topping makes a great autumn meal! This creamy, cheesy mac 'n' cheese is not only gluten free, but bursting with the wonderful flavor of butternut squash as well! Topped with gluten free breadcrumbs, this dish will satisfy all of your comfort food cravings! Looking for a comforting dish to keep you warm this winter? Look no further. This creamy noodle dish gives other mac 'n' cheeses a run for their money with its subtle hints of rosemary & nutmeg coupled with the added dimension of butternut squash & crunchy breadcrumb topping...yum, yum! Super creamy, cheesy and delicious Gluten-Free Butternut Squash Macaroni and Cheese with a flavorful breadcrumb topping! Cook elbow macaroni according to package directions, drain well. Set aside.Add butternut squash to a food processor or blender & puree until smooth. Add 1/2 cup of water & blend again. Set aside.In a large skillet or saucepan over medium heat, add the butterWhen butter is melted, add your gluten free flour & whisk.Add nutmeg.Cook for 3-5 minutes, whisking constantly.Add your water/sour cream mixture, and whisk until smooth. Turn heat to high & bring to a boil while continuing to whisk. After your sauce has thickened, turn heat to low & then whisk in your butternut squash mixture.Stir in fresh rosemary.Add cooked elbow macaroni to the pan & then stir until noodles are well coated. Turn off heat. Season with salt & cayenne (to taste).Prepare your gluten free breadcrumb* topping by stirring in a pinch of rosemary, a pinch of salt & a dab of melted butter into your breadcrumbs & then tossing to coat. Set aside.Preheat oven to 400° F.Grease a casserole dish (I used a round 8").Pour half of the macaroni noodles mix into the pan.Sprinkle half of the sharp cheddar/parmesan mix over the noodles.Add the remaining noodles & then top with the rest of the cheese mix.Sprinkle your prepped breadcrumbs on top.Place your pan in a 400° F oven & bake for 30 minutes, or until bubbling & beginning to brown.Remove from oven & let it sit for a few minutes before serving. Enjoy! * To make breadcrumbs from leftover bread, toast slices in a 250° F oven for 10 minutes or until well toasted & dry. Pulse in food processor or mortar & pestle until crumbs are the consistency you would like.